There are a variety of issues with development that will cause problems with both achieving and maintaining the proper tongue posture. Fortunately the body has an amazing capacity to correct and heal itself if given the time and effort – indeed even the bones will reform with pressure over time in accordance to Wolff’s Law. The most common tongue posture issues will be discussed in this article, if you have questions or believe there is a tongue posture issue which is not addressed, discuss it in our community forum! The incorrect development of the skull and a lack of sagittal (forward) and transverse (side to side) growth of the maxilla will result in a lack of space for the tongue in both of these dimensions. The way that these bones should have correctly been developed is discussed in our article Proper Development of the Skull and Posture after Birth. The soft tissues of the body, such as the tongue, grow to the size that is given by the instructions in your DNA whether or not you maintained the tongue posture to provide the required space. As a result, you may have one of two issues, or both. When trying to keep proper tongue posture, your tongue is partially in your throat and causes an inability to breathe fully. This means that your maxilla is not developed enough sagittally, and needs to be moved up and forward to give your tongue more room and free up the airway of your throat. Often a lack of development here results in an underbite or overbite. When trying to keep proper tongue posture, you may not have enough room between your molar/wisdom teeth to fit the width of your tongue. This is a result of lacking transverse (side to side) growth, which also results in a narrow nasal airway and is a tell-tale sign of maxillary recession. The upper jaw, which is part of the lower maxilla, needs to be widened to allow the tongue to sit comfortably between the molars and to create a wide nasal airway. First: The free solution that will result in permanent and continuing changes is to fix your tongue posture as much as you can and allow the bones of your face and skull to adapt over time. There is a guide to the posture and terms(which you may have come from) in our article here. If you do not have enough forward growth, you will have to consciously focus on the tongue applying pressure all along the Mid-Palate Ridge, and especially towards the Front Ridges and Tip. This will develop your maxilla forwards and upwards over time, through both repositioning of the maxilla as well as growth at the sutures within the craniofacial complex. If you lack transverse (side to side) growth, you will need to fold your tongue to keep it resting along the Alveolar Ridge and Mid-Palate Ridge which will result in growth in the width of your maxilla as well as forward movement. The younger you are, the quicker these changes have the potential to happen. A child that is still growing will see phenomenally fast results, a fully developed adult will see slower but consistent change. Users are discussing the increase in tongue space that they have developed in our forum. Second: The second solution is to pursue palate expansion with a device. The medical community is slowly moving past the incorrect notion that adult sutures fuse, and many medical professionals are now finding that adult palate expansion works. With a wide survey of your local dentists and orthodontists through email, you will most likely find a local professional who has experience in expanding the palate of adults without surgery (SARPE). There are many different devices on the market which may be used to expand the palate, each moving at different paces and covering different parts of the mouth. This expansion can happen as rapidly as 1mm per week. However you will likely need to wear a retainer, as there will be a relapse if you are unable to maintain proper tongue posture – which is why this is most important. This is a very common problem that will take time and effort to correct – but once you are able to Mew / maintain tongue posture while asleep you will see more rapid changes. You will no longer be relapsing on the work done during the day while asleep, and in fact be providing upwards and forwards force on the maxilla virtually 24/7. Your posture is largely subconscious – and this is why changing what your body does subconsciously can be the most difficult and rewarding process that you can accomplish. The key to changing this posture is to realize that the position of the front your tongue is largely a conscious decision, while the back third of your tongue operates subconsciously. If you take care throughout the day to monitor the back of your tongue and police it back into place at the roof of the mouth while awake it will eventually become retrained to the point where you will wake up with your tongue locked in the proper posture. For many people this will correct snoring that is caused by the tongue dropping into the airway. Like most postural issues, this is a result of one set of muscles being stronger/weaker than their corresponding set. This particular issue is caused by an imbalance between your muscles of mastication (chewing) and your tongue. When you keep proper tongue posture and find that your teeth now seem to rest apart, your tongue is overpowering the muscles which attempt to close the mouth, thus keeping your jaws open. The method to correct this is by chewing harder foods and/or chewing tough gum in order to strengthen the chewing muscles. The opposite case involves your tongue being too weak to keep the jaws apart, resulting in teeth grinding. This solution to this issue is to consciously apply force against the upper palate with the tongue throughout the day, with which you will find that the tongue gains strength quite rapidly. Eventually you should have both of these sets of muscles (And the muscles associated with them) in balance, and will be able to strengthen both in unison. Stronger chewing muscles will impart more force to a stronger tongue, which will keep the teeth gently touching by transferring this force upwards and forwards into the palate and maxilla. This issue is most likely caused by a tongue tie, especially if you are unable to even reach the front/tip of your palate with the tongue. It is recommended that you visit a medical professional to have this examined, and very much urgent that you have this done if you see such problems in a child. 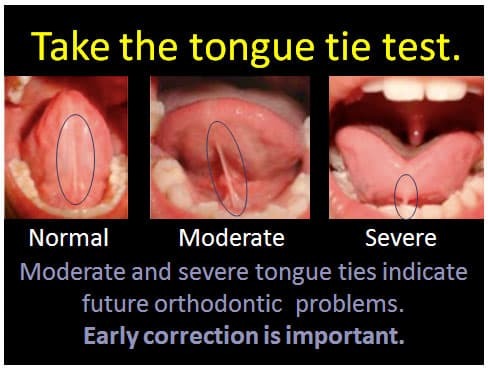 The tongue tie keeps the tongue anchored to the floor of the mouth, and will often require surgery in order to correct. However, you need not jump to the conclusion that you have a tongue tie if you are unable to get the back of the tongue to the roof of the mouth the first few times that you attempt proper tongue posture. This position, after many years of holding incorrect posture, can feel so unnatural that you are unable to manipulate your tongue properly to achieve it. One trick is to hold a big and wide cheesy smile, as wide as you can, and then swallow. This ensures that you are swallowing with your tongue and not with your cheeks, and you will be able to feel how far back in your mouth your tongue lands using this method. If you are experiencing other tongue posture issues, or would like to discuss any of the ones mentioned here, join the discussion on our community forum!